After knowing about ls command for listing entries inside directory, we are now moving to creating directory in Linux system. On Linux, we can use mkdir command. Mkdir is short for “make directory”. Mkdir is a command for creating directories in Linux system. This command is a built-in command. You can type mkdir directly from your console to use it. From screenshot above, we created directory called office. When we run mkdir command, we are in/home/pungki directory. So then the new directory, which is office, is created under /home/pungkidirectory. If we put an exact location – for example : /usr/local – , then Linux will create a directory under /usr/local directory. When Linux found that the directory which suppose to be created is already exist, then Linux will telling us that Linux can’t cretate it. Another pre-requisite of creating directory that you must have access to the location where the directory want to be created. When you don’t have it then mkdir will report an error. Using -m parameter, we can also set the access privilege for the new directory on-the-fly. Here’s an example. The above command will create a directory named letter and give access privilege read-only for thedirectory owner, directory group owner and anybody. If we want, we can use -v parameter to do this. Here’s an example. Mkdir command is also one of the basic command that must known for everyone who want to learn Linux. As usual, you can always type man mkdir or mkdir –help to display mkdir manual page and explore it more detail. In Linux every single file is associated with timestamps, and every file stores the information of last access time, last modification time and last change time. So, whenever we create new file, access or modify an existing file, the timestamps of that file automatically updated. 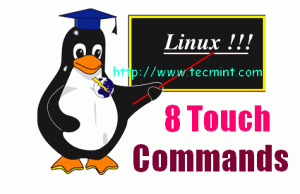 In this article we will cover some useful practical examples of Linux touch command. The touch command is a standard program for Unix/Linux operating systems, that is used to create, change and modify timestamps of a file. Before heading up for touch command examples, please check out the following options. The following touch command creates an empty (zero byte) new file called sheena. By using touch command, you can also create more than one single file. For example the following command will create 3 files named, sheena, meena and leena. To change or update the last access and modification times of a file called leena, use the -a option as follows. The following command sets the current time and date on a file. If the leena file does not exist, it will create the new empty file with the name. The most popular Linux commands such as find command and ls command uses timestamps for listing and finding files. Using -c option with touch command avoids creating new files. For example the following command will not create a file called leena if it does not exists. If you like to change the only modification time of a file called leena, then use the -m option with touch command. Please note it will only updates the last modification times (not the access times) of the file. You can explicitly set the time using -c and -t option with touch command. The format would be as follows. For example the following command sets the access and modification date and time to a file leena as 17:30(17:30 p.m.) December 10 of the current year (2012). Next verify the access and modification time of file leena, with ls -l command. The following touch command with -r option, will update the time-stamp of file meena with the time-stamp ofleena file. So, both the file holds the same time stamp. If you would like to create a file with specified time other than the current time, then the format should be. For example the below command touch command with -t option will gives the tecmint file a time stamp of18:30:55 p.m. on December 10, 2012. We’ve almost covered all the options available in the touch command for more options use “man touch“. If we’ve still missed any options and you would like to include in this list, please update us via comment box. You need to use the rmdir utility / command. The rmdir utility removes the directory entry specified by each directory argument, provided it is empty. Arguments are processed in the order given. In order to remove both a parent directory and a subdirectory of that parent, the subdirectory must be specified first so the parent directory is empty when rmdir tries to remove it. Please note directory often referred to as a folder in the Apple Mac OS X and Microsoft Windows operating systems. WARNING! These examples may crash your computer or may result into data loss, if executed without proper care. After knowing about copy command, the next command which is related is mv command. When you want to move files from one place to another and you don’t want to duplicate it, then mv command is absolutely right for this task. mv command is a command that similar with cp, but it does not create a copy / duplicate of files or directories. This command is installed by default on your Linux system, in any kind of Linux you are using. Please take a look of some examples using mv command in day-to-day operation. As we can see, when we move the file_1.txt, the file_1.txt from previous directory is deleted. If we want to move multiple files, we put them in one line separated by space. Different from the copy command, moving directory using mv command is pretty straight forward. To move a directory, you can just to use mv command without any options. Please take a look screenshot below. We also use mv command to rename files and directory. But in order to do so, the destination location must be the same with the source location. Then the file name must be different. When you are moving or renaming a large number of file / directory, you may want to know does your command works successfully or not without seeing to the destination location. To do this, we can use -voption. For example we want to move all txt files and want to check it. Then the command will be like this. The same way is applied to directory. When you are moving file into another location, and there is already exist the same file, then by default mv will overwrite it. No pop-up notification for this. To make a notification for overwriting file, we can use -i option. Let say we want to move file_1.txt to /home/pungki/office. Meanwhile, file_1.txt is already exist in /home/pungki/office directory. This notification will aware us about the existence of file_1.txt in the destination location. If we press “y” then the file will be moved, otherwise, it will not. While -i are notify us about overwriting files, then -u option will perform update only if the source is newer than destination file. Let’s take a look example below. We want to move them into /home/pungki/office directory. But in the destination location, we already have file_1.txt and file_2.txt. As the result, we see those files are moved. Those file is moved because their last modified time stamp is newer than the files in /home/pungki/office directory. If -i options is asking us about overwriting files, than -n option will not allow us to overwrite any existing files. Using example on point 8, if we change the option from -u to -n, combine with -v option, then we will see that there are no files moved into /home/pungki/office directory. By default, moving files will overwrite the destination files if there are already exist before. But what happen if you are moving wrong files, and the destination files are already overwritten by the new ones? Is there a way to retrieve the old one? Yes there is. We can use -b option. -b option will make a backup of destination file before it overwritten by the new one. Once again, we will use scenario from point 8 above. As you can see on the screenshot, on the /home/pungki/office directory, we have a file named file_1.txt~ and file_2.txt~ . The tilde sign (~) means that those files are backup. We can see the attribute of them is older than file_1.txt and file_2.txt. Moving file or directory also one of the basic command in Linux system. As usual you can type man mv or mv –help to display its manual page to explore more detail. Copying files or directories is one of basic activity in every operating system. Backup activity is basically is creating a copy of files and directories. On Linux system, we can use cp command to do it. If we don’t type absolute path, it mean that we are copying a file on current directory. From example above,myfile.txt is located in /home/pungki/Documents. We don’t have to type/home/pungki/Documents/myfile.txt to copy myfile.txt if we are in that /home/pungki/Documentsdirectory. While /home/pungki/office is a folder where the file will be copied. If you got that error, the directory will not copied to the destination folder. Copying file means you must have some space on the storage to store the copied files. Sometimes for any reasons, you may want to create “shortcut” or links to the files instead of copying them. To do this, we can use -l option. From screenshot above, we see that a hardlink of file_4.txt was copied into /home/pungki/office/file_4.txt. It marked by the same inode, 835386. But please note, hardlinks cannot be created into directories. Let’s take a look an example below. There is another type of links called softlinks or symbolic links. We use -s option to do this. Here’s a sample command. Creating symlinks only can be done in current directory. On screenshot above, we want to create symbolic links from source directory – /home/pungki/Documents/file_6.txt to /home/pungki/office. But to create symbolic links, I must inside /home/pungki/office as a destination folder. Once I manage to be there, I can run cp -s command above. Then when you list the file with detail, you will see that /home/pungki/office/file_6.txt is pointing to the original file. Its marked with arrow sign after the file name. To do this, we can use -P option. When cp command found a file with symbolic links, it will copy the as is. Take a look at the sample below. As you can see, the cp command will copy file_6.txt as is. The file type still a symbolic link. Now we can do this with -L option. Basically, this is an opposite of -P option above. Here’s the sample. With this option, the copied file is the same file with the source file of file_6.txt. This is known from the file size. The copied file has 50 bytes file size while the file_6.txt as symbolic link has 33 bytes file size. The above command will copy a directory named directory_1 into folder /home/pungki/office. As you can see, the file_6.txt still copied as symbolic links. By default, when copying activity is success, we will see a command prompt again. If you want to know what happen during the copying file, we can use -v option. When we copying all txt files in current directory to /home/pungki/office/ directory, -v option will show what is being done. This additional information will make us more sure about the copying activity. To do this, we can use -u option. Take a look this example below. In the beginning, we see file_1.txt has 0 bytes file size. Then we edit it using vi, add some content and save it. Next, we see the file size has changed into 36 bytes. Meanwhile in /home/pungki/office directory, we already have all *.txt files. When we use -u option, combine with -v option to see what is being done, cp command will only copy a file(s) which is newer from destination directory. As the result, we see that only file_1.txt is copied into /home/pungki/office directory. Interactive mode will ask if the destination folder have already the file. To activate interactive mode, use -ioption. Cp command also provide us with –attributes-only option. As we can guess from its name, this option will only copy a file name and its attributes without copying any data. Here’s a sample. From screenshot above, the original file_6.txt file has 50 bytes file size. Using –attributes-only option,the copied file will have 0 bytes file size. This is because the content of file is not being copied. Using -f option will force the copying activity. If the destination files cannot be opened, then -f will try again. To do this, we can use –remove-destination option. This option is contrast with -f option above. If the cp command find the same file name on the destination folder, cp command will remove destination file first, the copy the new one. Here’s an example. Cp command is one of basic Linux commands. For those who want to learn Linux, must know this command. Of course you can type man cp or cp –help from your console to display its manual page to explore more detail.